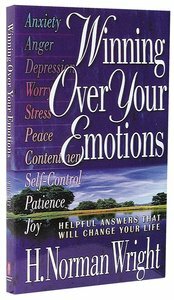 About "Winning Over Your Emotions"
In todayas fastaopaced world everyone struggles with worry,anxiety, anger, and stress. But bestselling author Norm Wright explains thatthese emotions donat have to defeat us, and offers a practical, stepaobyaostepguide to break free of worry and transform stress into positive action. Depression, anxiety, anger, stress---are your emotions swallowing you alive? Wright shows you how to enlist God's aid and take control of these powerful feelings before they control you. You'll learn how to transform stress into positive actions, break lifelong patterns of worry, alleviate depression, help others who are struggling, and more. In today's fast?paced world everyone struggles with worry, anxiety, anger, and stress. But bestselling author Norm Wright explains that these emotions don?t have to defeat us, and offers a practical, step?by?step guide to break free of worry and transform stress into positive action.